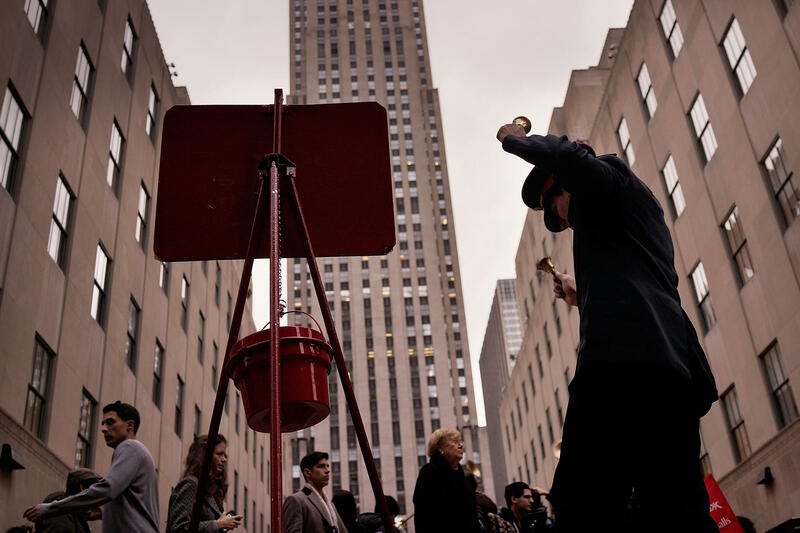 A bell ringer with the Salvation Army in New York City in 2014. Nonprofit groups estimate that the new tax bill proposed by House Republicans could reduce charitable giving by $13 billion annually. Steve Taylor, senior vice president and counsel for public policy at United Way Worldwide, notes that about a third of taxpayers currently itemize their deductions, including for charitable donations. "Under this new proposal, only about 5 percent of people will itemize their taxes," he says. "What that means is effectively millions of Americans that currently claim the charitable deduction will lose it." The Republican plan would double the standard deduction that taxpayers get in lieu of itemizing to $12,000 for individuals and $24,000 for couples, making it much more attractive not to itemize. Una Osili, of the Lilly Family School of Philanthropy at Indiana University, estimates that change would lead to a reduction of up to $13 billion a year in charitable giving, and 28 million fewer Americans itemizing their returns. She says it doesn't mean these people would stop giving, just that they're likely to give less. And, she adds, "it could disproportionately affect certain kinds of charities that draw more on the average American family," such as churches and smaller community groups. Tim Delaney, president and CEO of the National Council of Nonprofits, says a drop in donations is worrisome at a time when Congress is also trying to cut spending on domestic programs. His group represents 28,000 charities across the nation. "That will lead to more people having more needs," he says, noting that charities will be expected to pick up the slack. "We're just concerned that this is going to overwhelm the nonprofit community." As a result, nonprofits are pushing Republicans to include something else in their tax plan that they say would increase charitable donations, but keep taxes simple: They want something called a universal charitable deduction, which taxpayers would get on top of the standard deduction. One proposal, by North Carolina Republican Mark Walker, would set the deduction at about $2,100 for individuals and $4,200 for couples. One potential stumbling block is that the change could cost the Treasury several billion dollars a year, but nonprofits plan to pull out the stops in the coming weeks to make their case. "There's 1,150 United Ways in the United States," says Taylor. "That means there's at least one United Way in every single congressional district. And so over the next couple of days and into next week, those United Ways are going to be reaching out to their members of Congress." As will tens of thousands of other nonprofits around the country. Taylor admits they are up against a lot of other powerful interests — such as homebuilders — that will be lobbying Congress to preserve tax breaks that are important to them. Dan Cardinali, president and CEO of Independent Sector, which represents 1.6 million nonprofits, has another concern. He notes that the Republican bill would also eventually eliminate the estate tax. Cardinali says that would discourage billions of dollars in donations from wealthy individuals who want to avoid subjecting their heirs to the tax.